How Do I Use a Coupon to Get a Good Deal? There are generally two types of coupons, ones that require special "coupon codes" and ones that are automatically applied by clicking on our specially formatted links to the store's website. Please review the information below to determine which coupon is needed for the savings on your product and specific instructions on how to use the coupon. If a specific coupon code is needed for the discount, you will see the required code either next to the coupon amount or under the description for the coupon. Then, you will simply need to click the "get this deal" button and we will provide you with a reminder box displaying the coupon code and brief instructions on how to apply it for that store. Once you are viewing the product on the store's website, you will simply need to add the item to your shopping cart. 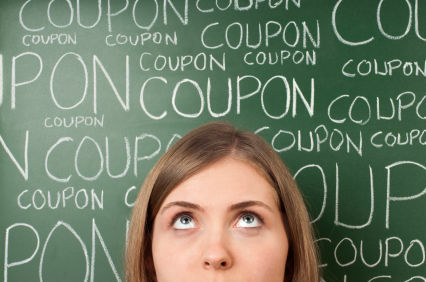 Most coupons are also able to be used across any products on the store's website unless otherwise noted. Coupon codes are generally able to be applied either in your shopping cart or during the checkout screen. If you do not see a place to enter the coupon code on your shopping cart screen, please continue to the checkout. Please note: stores may also call coupon codes by the term "promotional codes", "discount codes", "claim codes" or "voicher codes". When entering coupon codes during the checkout process, generally you will see a place to apply the coupon code on the payments screen or afterward while reviewing your order. If you need help finding where to apply your coupon code, please do not hesitate to contact us. If no coupon code is given, then you simply need to click the "get this deal" button to automatically activate the coupon and we will provide you with a special reminder box containing specific intstructions on how to proceed. Sometimes a store may require a special entry screen for activating the coupon. If you arrive at a special entry screen, you will need to click to continue to the store's website, and then search for the item you are looking for. Please note: you may not see the savings for the coupon until you add the item to your shopping cart or until you arrive at the review screen during the checkout process. Just remember to verify the discount or offer was applied before finalizing your order. As always, if you have any problems or questions, please do not hesitate to contact us. Home > How Do I Use a Coupon with a Product Deal?